TIME'S RUNNING OUT - $30 GIVEAWAY WINNER IN ONE WEEK! I wanted to remind all of my readers, and crafters to get your name in the running for my $30 gift certificate giveway for Simon Says Stamp! I will be drawing the name on Friday, November 4th!! Tell your friends!! I would love to have more people have the chance for this. It is my one year bloganniversary!! You can go HERE, and just make a comment about my blog, or me, or whatever you'd like! IT IS THAT SIMPLE!! Good luck with those who have entered!!!! I will be back soon with another card share! Good Tues Evening! I am back to share with you a birthday card I made for a good friend of mine, and the gal that got me into card making 2 years ago. It was her birthday on the 10th of October, and like me she loves purple, and butterflies. So, I wanted to incorporate both! I was one of the luck ones that bought and received the Limited Edition Seasonal Distress Inks for fall this year. These colors are gorgeous and they compliment the rest of the colors of DI so well. On this card, I used the purple color which is Seedless Preserves, and Wild Honey. The background stamp is from Hero Arts/Basic Grey. I did one of my favorite techniques - Emboss resist! This technique is so much fun and easy!! 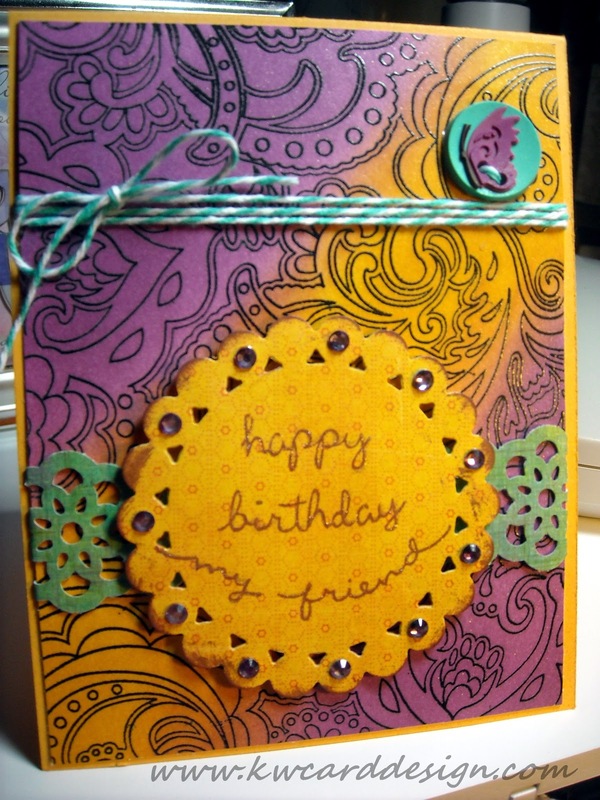 To make my birthday sentiment pop, I die cut a piece of patterned paper from one of my Beaded Circles dies from Spellbinders and punched out a ribbon border from the Lace ribbon punch from SU!. I didn't have any purple gems to match, so I took one of my Copic markers that was close, and colored some of my clear gemstones from SU!. This is another great way to use your Copics! I added some Baker's Twine - who doesn't love this stuff. It is so easy to work with and it is so versatile! The "softie" with the butterfly image comes from KI Memories. My card base is from PTI in Summer Sunrise! I love PTI for my card bases! 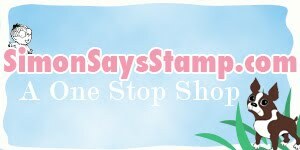 Another reminder that I have a giveaway going on for a $30 GC from Simon Says Stamp!! Don't miss your shot at this great prize to celebrate my one year anniversary for my blog!!! You can leave your comments on THIS post! Thanks for stopping by!! I appreciate your comments!! Good Sunday afternoon! It is another beautiful fall day here in SW Missouri!! A great day to have the windows open ( which I am loving since we have new windows in the house), and to craft your heart away. 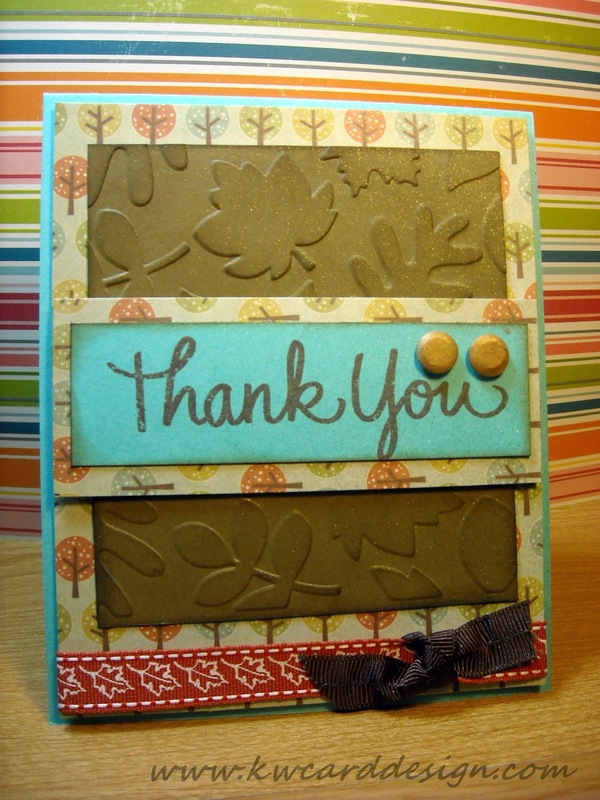 Today I wanted to share with you a Fall Thank you card I made for a coworker of mine. She covered for me while I was out a couple of days a few weeks back, and I wanted to thank her for it. I had found the cute embossing folder at Hobby Lobby ( Paper Studio) and I couldn't pass it up. It was only $5! Not bad. Since I don't have all the wonderful craft places in my town, I have to drive about an hour and a half to soak up all the wonderful craft goodness at Michael's and Hobby Lobby. It probably is a good thing I don't live any closer to those places, because I would probably spend money I didn't have! Not a good thing! Anyhoo - back to my card. 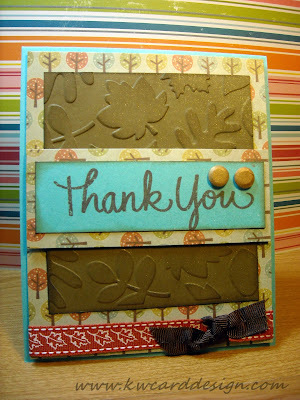 I used that embossing folder, and the patterned paper is from the 6 x 6 pad called Autumn Splendor by We R Memory Keepers. I just love love this paper! It has so many beautiful patterns and colors. It has owls in it too which is quickly becoming something that I like a lot! They are so cute!!! I adhered everything onto a piece of Hawaiian Shores c.s. by PTI. My sentiment comes from Stampendous called Happy Messages. I love how big and bold it is. I added come "Candy". These embellishments look like brads, but they take the weight and bulk out of it. The ribbon is some "cheap" ribbon I bought at a dollar shop in Branson, Missouri. To add to shimmer I sprayed some Gold Perfect Pearls Mist. I Love this stuff too!! I hope you like as much as I do! I want to remind everyone to leave your comments on this post to enter your chance to win a $30 dollar gift certificate to Simon Says Stamp by Friday November 4th to celebrate my one year BLOGanniversary! Don't miss your chance!! Hi all! I wanted to pop in and give an update to my blog readers as to what has been going on with me, and why the sparse blog posts. So - I am going to ramble on about what has been going on, but something special in store for my BlogAnniversary!! if you keep reading!! I am still here, and I haven't fallen off of the face of the earth! The reason why I have been MIA a lot, is simply put LIFE has taken over, and there hasn't been a lot of time to do the things that I WANT to do like my paper crafting! The last few months work has been crazy busy and that is majority of why I haven't posted anything. When I want to post, I am too tired, just because of trying to fit the everyday things in. Also, my husband and I had all new windows replaced in our home. So - with that we had to prepare the house by moving and rearranging things, furniture, etc. that had anything near a window. We now have 10 new windows, and I am happy about it. The ones we had were the old wood windows, and not very energy efficent. Also - I went on a weekend trip to Branson, which I might have mentioned in another post which was a lot of fun!! Learned new things, and tried new products! My mom stayed with us the same week of our windows being put in, so we had to work around that too, because we have a small house, and don't have an extra bedroom, so my poor mom had to sleep in the living room on the couch. She was a trooper though! In the midst of all this - I was planning a birthday gathering for my mom for her 60th birthday!! My dad was helping me plan, because my parents and I live an hour apart which isn't bad, but not convenient when your planning an event. Also, he had to go to Colorado for an extra money job that was last minute, and left the "planning" to me. I have to say thought the party was a hit, and I got to see my brother, sis in law, and nephews after a year!! In other happier news:::: I am 20 days out of having my BLOGanniversary!! I can't believe it!! I will be celebrating my ONE year anniversary for my blog - and I want to celebrate in true blog fashion by doing a giveaway! I don't have the means to do BLOG CANDY, however I do want to giveaway something crafty to whomever reads my blog, SO - I will giveaway a $30 gift certificate/card to Simon Says Stamp!! If anyone is not familiar with SSS - then first I would say, where have you been? Then, I would say they are one of the Largest Online Stores for paper crafters. Let me say that they are not paying me to "endorse" them or anything. I just love that store, and they have pretty much everything you can imagine for your crafting wish list! So - with that said - the rules are - IF you are a follower, or read my blog at all- leave a comment on the blog post by Friday - November 4th, and I will use random.org to choose a winner!! Tell your friends, tell your neighbors who are crafters!! OK- that is my update - so be sure to leave a comment. You can tell me if you are just a reader, or if you both a reader/follower. If there are things you would like to see here on KWCardDesign, please let me know!! I can't wait to read your comments!!! !